Remember the skylights of years ago? They were often cut into the ceiling at an angle, perhaps shaped like a bubble, and sometimes dripped with condensation during the hottest days. They might have been in flat panels, and those panels would have to be cleaned every so often to remove the accumulated leaves and other debris bestowed by Mother Nature. Today's skylights aren't limited by certain sizes or shapes, and can be installed virtually anywhere in your home. A bank of skylights in your ceiling can transform the entire space, not only with natural light, but by becoming dramatic architecture themselves. 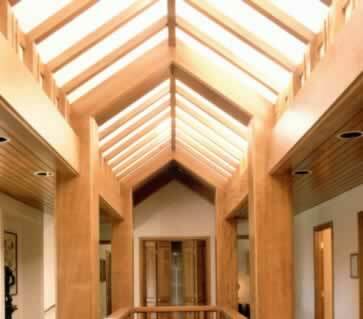 Soaring ceilings that are filled with skylights let the light in while making a bold design statement! With excellent energy-efficiency and double-pane and triple-pane technology, skylights can provide an exceptional decrease in your energy bills over time. Don't be hindered by the thought that only one or two skylights is all you need, the sky's the limit!